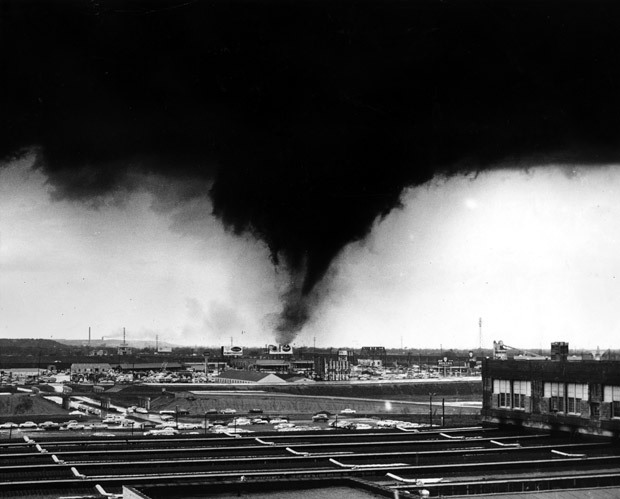 On April 2, 1957, the famous Dallas tornado (tornadoes, actually) ripped across the city. At the time, it was the most photographed tornado in history, and the photographs and film footage taken that day were immensely important in the study of how tornadoes form and behave. The above photo is from a landmark study by the United States Weather Bureau (link to the full report is below). Above, a photo by Bill Winfrey of the Dallas Morning News, taken from the roof of the News building, looking toward Oak Cliff. I just stumbled across the odd little film above, produced by the National Assn. of Broadcasters in the late ’50s. If you skip to about the 4:30 mark, you can see a WFAA Channel 8 reporter/cameraman running to his news vehicle, followed by a minute or so of the clearest film footage of the Dallas tornado I can find online. Since the tornado has been written about for years and years and years, there’s nothing I can add, really, except to mark another anniversary. ALTHOUGH, the following paragraph (from the official U.S. Weather Bureau report) has been sorely under-reported: the affect of tornadoes on the behavior of rubber duckies. Top photo and clipped text from “The Tornadoes at Dallas, Tex., April 2, 1957 — Research Paper No. 41” (Washington: U.S. Govt. Printing Office, U.S. Department of Commerce, Weather Bureau, 1960). You can access the entire official report — containing numerous photographs, charts, interviews with Dallasites who witnessed the tornado(es), and results of the Bureau’s research — here. It’s very interesting. The second photo is from the great Dallas Morning News photo blog, here. The National Association of Broadcasters’ self-aggrandizing pseudo-PSA film, “A Guest in the House,” can be found here. 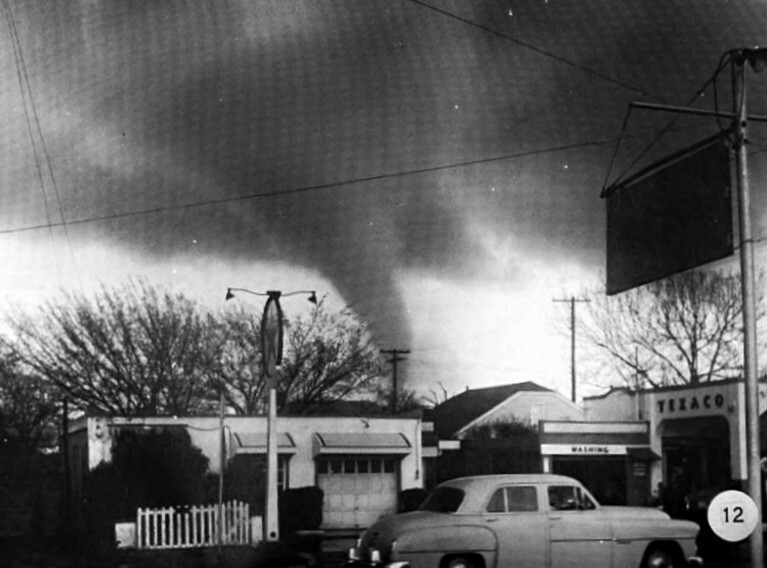 And, finally, everything you ever needed to know about the 1957 tornado is here.